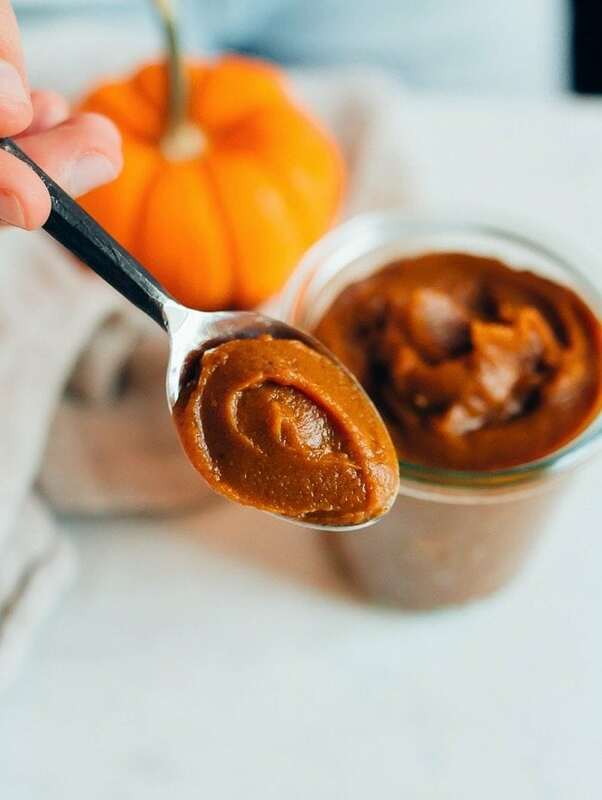 A quick 10 minute pumpkin butter recipe made using the microwave. 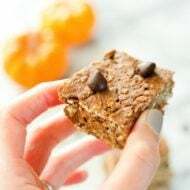 Only 8 ingredients and a perfect snack for fall! Pumpkin butter is such a glorious invention. I honestly just googled “who invented pumpkin butter” because I wanted to give this person a shout-out. Alas, even google doesn’t know who invented it or why butter is in the name when there’s absolutely no butter or dairy involved? It’s an unsolved mystery. 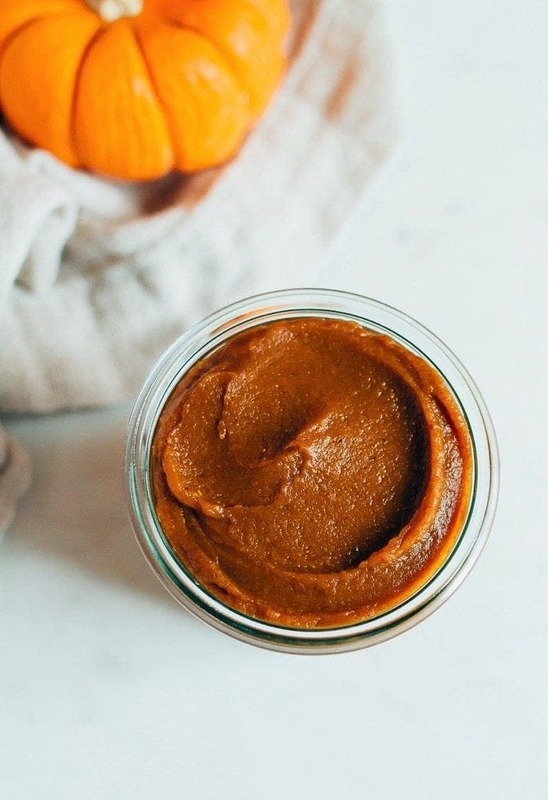 Anyhow, I’m a pumpkin butter lover… even if it doesn’t have any butter. 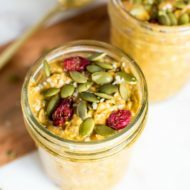 I love using it throughout the fall and winter months — mainly as a spread on toast or a topping for oats, chia pudding, yogurt or pancakes, but I’ve been known to eat it by spoonful here and there as well. No shame. I usually buy a jar from Trader Joe’s (their version is pretty good and doesn’t have any weird ingredients) or make my slow cooker pumpkin butter, but last week I wanted something quick and easy so I used Kath’s recipe as a guide to make a version free of refined sugar — with maple syrup and coconut sugar. 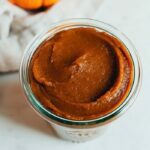 This quick pumpkin butter tastes awesome, with all the sweetness and warm spiciness you expect from pumpkin butter. The best part? You only need 8 ingredients, a big bowl and a microwave. No need to worry about setting up your slow cooker or any of that jazz. 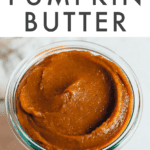 I literally made a batch of this pumpkin butter while making a quick breakfast of eggs and toast one morning. It was done cooking right as my toast popped out the toaster oven. 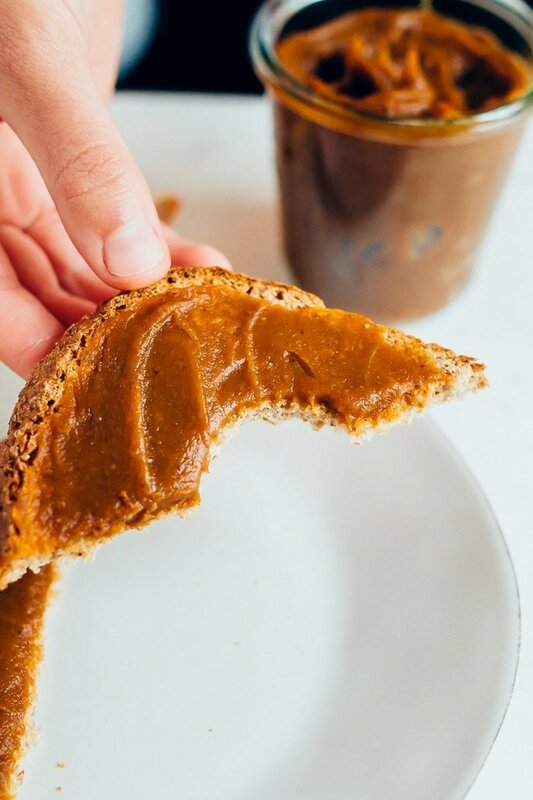 Warm pumpkin butter spread over a slice of toasted bread = the best! 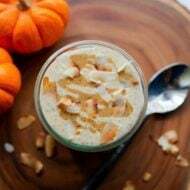 If you try this 10 minute pumpkin butter please let me know how you like them in the comment section and don’t forget to leave a star review. You can also tag me on Instagram @eatingbirdfood, #eatingbirdfood. Your feedback is so helpful for EBF and all readers! Add all ingredients except the canned pumpkin into a microwave-safe bowl. Mix well, and microwave on high for three minutes. Carefully remove from the microwave and stir. Add canned pumpkin into the bowl and stir until it’s mixed in. Place bowl back in the microwave for an additional 5 minutes. Carefully remove from microwave, stir, let cool and enjoy! Place leftovers in a jar and store in the fridge for a couple weeks. Yum! Do you you think it would work to do the same thing with apple sauce to make a quick apple butter? Oh! I’m not 100% sure, but now I want to try it!! OK, just took the pumpkin puree out of the freezer. This may be a mistake, because now I’ll be putting this on every single thing. A VERY GOOD MISTAKE. Loved this – such a great and easy recipe, thanks! Yay! I’m so glad you liked it, Jess. ???? Just made this. Tastes just like my favourite store-bought organic pumpkin butter! Thanks for such an easy and delicious recipe!! Also, way cheaper than buying it! This sounds too good to be true! Pinning and trying it very soon! I don’t think my last comment went through. I made this last night! It was really easy to make :), really delicious and tasted just like my favourite organic store-bought pumpkin butter! Also, a lot cheaper to make at home. Thanks for such a great recipe! 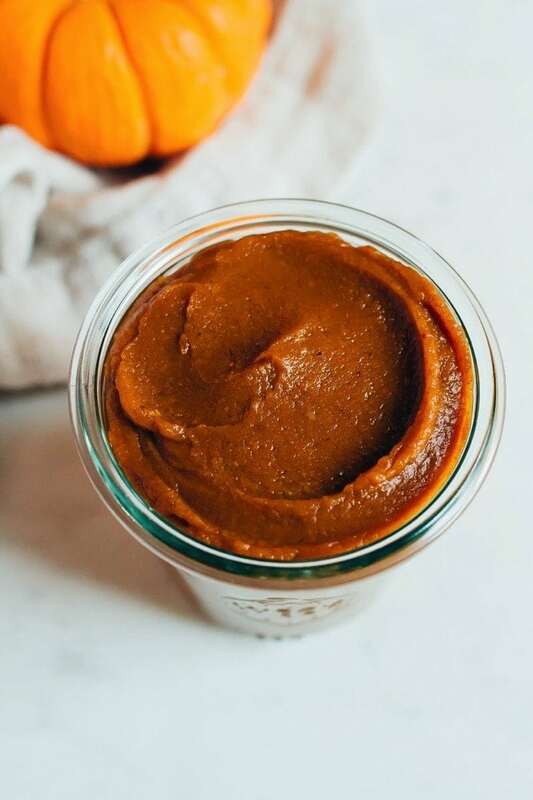 It’s crazy that you made that delicious looking pumpkin butter in 10 minutes!! It’s like you can’t NOT make it:) I eat it by the spoonful, too! Hi! Can I do it from home made Pumpkin puree?